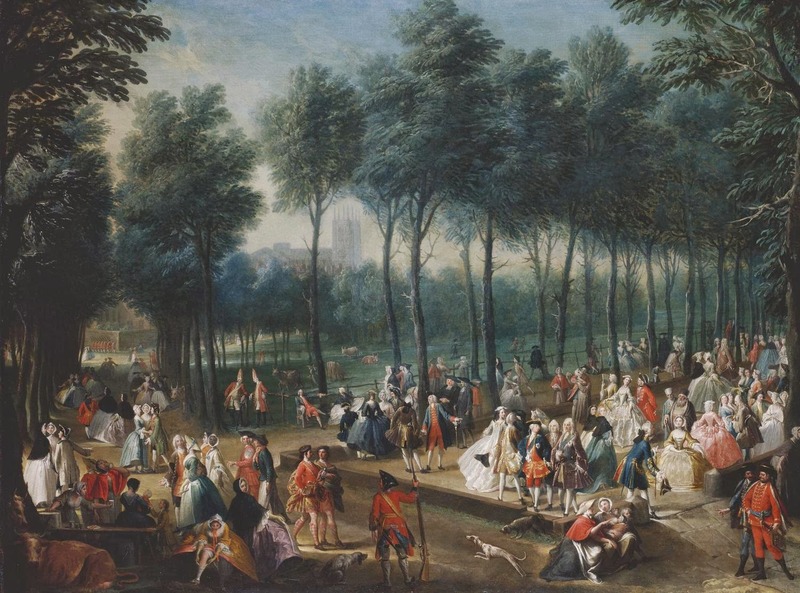 St. James Park and the Mall, artist unknown, c.1745, from the Royal Collection Trust. There's a lot going on in this beautiful and busy painting. Soldiers, citizens, men, women, dogs and cows all gather in St. James Park. Among the throng is a sailor! Can you find him? The sailor holds an orange/red neckcloth in one hand. His keeps his free hand in his trouser pocket. Many images do not show whether slops or trousers have pockets. This omission is likely because these articles were of a loose fit. Pockets aren't often illustrated. We can see that the pocket goes rather deep. Our sailor can rest his hand in the pocket by leaving his arm almost at its natural length. Unlike modern jean pockets, he does not need to bend his arm at the elbow. He has buttoned his single breasted waistcoat up with brass buttons. The cuffs have brass buttons matching those on his front. This painting shows a cocked hat pointed forward, or cocked over the right eye. This painting is a wealth of representations, of which the sailor is only a small part. Be sure to search out some other nuggets!